THE NAB AFL Draft continues to edge closer, which makes it a good time to update our Phantom Form Guide. The AFL.com.au ranking of the best players in this year's pool does not take into account where the prospects may get selected or where bids may come on father-son or Academy players. It is purely our view on who are the top group available in 2018. This is the second Phantom Form Guide of the year, and we will update it monthly in the lead-up to November's national draft. Walsh just continues to motor on, piecing together one of the most complete and consistent seasons seen in recent years for an under-18 prospect. Since the national carnival Walsh has played for the Geelong Falcons and dominated two weeks ago when he picked up 33 disposals, six tackles, six clearances and six inside-50s against the Oakleigh Chargers (the next most on the ground had 24 touches). He has a strong endurance base, kicks the ball well and has found a good balance between winning it himself and providing run. A gun. Many recruiters will have Lukosius at No.1 on their board and with good reason. The key forward is one of the best of his type to have come through the draft in the past few years. He leads smartly and continues to present all game, working up the ground to get the ball and then back closer to goal to be a threat. Lukosius has played in the SANFL senior side all season and kicked two goals from 14 touches and eight marks (plus he had five tackles) for Woodville-West Torrens in its important win over North Adelaide in July. Rankine hasn't blown anyone away with his form since the under-18 championships, but he has done more than enough over the past two years to highlight his talents. The brilliant half-forward/midfielder lit up the final game of the national carnival with a devastating five-goal display and it encompassed all of his best traits: sharp skills, uncanny goalkicking ability, a sense of the occasion and genuine pace. It's going to be fun watching him next year, and beyond. King is more than three months on from his knee reconstruction after suffering an anterior cruciate ligament tear while playing school football. The next step in his rehabilitation is to get back running. King, a high-marking key forward who kicked eight goals earlier this season in a commanding game for the Sandringham Dragons, would have vied for the No.1 pick if not for the season-ending injury. He is using St Kilda's facilities two days a week as part of his fitness program. An Achilles injury has kept Smith out of action the past two weeks, but he'll be keen to get back out there soon to finish off what has been an excellent season. Some recruiters have Smith in the No.1 pick conversation, such has been his capacity to impact games this season. He has a lot going for him as a modern midfielder given his size, endurance, speed and power. As hard-working and relentless as any player in the pool. King has spent the majority of this season forward since his brother Max's knee reconstruction, and Ben now favours it as his preferred position. 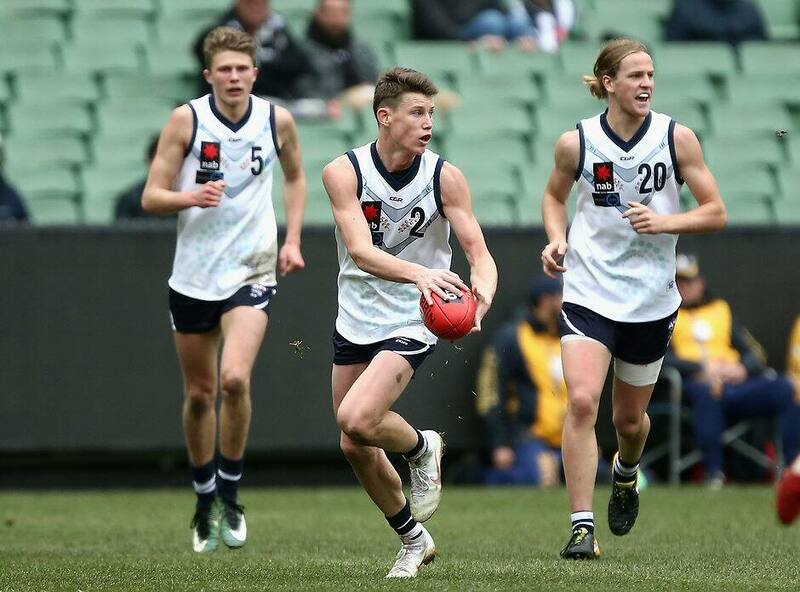 He kicked seven goals two weeks ago for school side Haileybury matched up against Will Kelly, who shapes as a possible top-30 pick and was in good form. King is a deadeye in front of goal, almost unbeatable on the lead and with some extra size on him once at an AFL club he will be difficult to stop in the air. Given his ability to play at both ends of the ground he's a very appealing choice. Blakey has missed some footy in the aftermath of the championships with some bone bruising in his left ankle. Blakey looks likely to cost the Swans their first pick at the draft as an Academy selection. He showed during the championships he could play as a tall forward and also in the midfield, where he moved in the Allies' final game and highlighted his strengths. A left-footer who is agile at ground level for his height. After an under-18 championships where he didn't reach his best, Rozee went back to North Adelaide and pieced together one of his best games of the season. The exciting half-forward/midfielder kicked three goals for its senior side and also laid four tackles against South Adelaide. Rozee might not have had the most consistent season but he remains one of the most talented players in it: he can jump, take big marks, land on his feet and get things going. Things tend to happen when he has the ball and he should be an early pick. Caldwell's championships was ruined by a hamstring injury, which saw him miss five weeks of footy. But the tough midfielder returned at school level at the end of last month and immediately showed his class to recruiters, some of whom went to the game just to watch him play. Caldwell is a tough, inside midfielder with a robust attitude and application to the game. He has the physicality to bust through and past players and should be seen as being in the best group of ball-winners available. It emerged after the division one championships that Thomas had been carrying a thumb strain and some bone bruising throughout the carnival. He took a couple of weeks off but returned recently for North Launceston. Thomas' championships for the Allies was a little underwhelming after he had starred for Tasmania earlier in the year at the under-18 Academy series. Thomas is a tough midfielder with good skills who can also play as a half-back or half-forward. Quaynor is a dependable type of defender who can match up on most types of forwards. He's quick and agile enough to play on the smaller options, and he can also shut down players who have height and size on him. He was named an All Australian after a solid under-18 carnival and has been consistent for the Oakleigh Chargers across the season. The midfielder has performed well at senior level for Central District across the season. Hately's appeal will come in his body size: at 190cm he is a big midfielder who uses the ball well, collects plenty of it and can also push forward. Hately seems to fit into the second bracket of midfielders in this year's pool and clubs will look at him as a player who could make an impact next year. A knee injury that Taylor played through during the national carnival for Vic Metro meant he took a bit longer to get back to playing for the Cannons. Taylor is a classy user of the ball, smart overhead and clever around goal, and you trust when he has it in his hands that something good will come of the disposal. He's not a huge possession-winner and hasn't played in the midfield as much as recruiters might have hoped to see. But as a half-forward there are few better than him in the draft. It hasn't been a dominant season for Hill, who missed the final game of the under-18 championships through suspension. However, the exciting West Australian has shown flashes of his talent throughout the year and remains one of the most eye-catching players in the pool when he's up and going. The second cousin of Freo pair Stephen and Bradley, Hill is small and plays across half-forward but eventually thinks he can bring his run and carry game into the midfield. The Western Bulldogs father-son prospect is one of the most regular ball-winners in the draft, particularly in the games that matter. His performances for Vic Metro at the under-18 carnival saw him named an All Australian, and he is good at digging in and getting his hands on the ball. He also likes to get forward and fly for a mark when he can. West can float in and out of games, but when he puts his mind to it he's hard to stop in the middle. Butters underwent shoulder surgery in July after carrying the injury as long as he could through the under-18 championships. It wouldn't surprise if he dropped a little down the draft order because of the injury layoff, but he is a smart, savvy player who runs with the ball and uses it well by foot. He defies his size by having a big impact on game through his line-breaking movement and capacity to also snag a goal or two. For an inside midfielder Collier-Dawkins doesn't have the type of big possession games that you might expect. But he does influence games with his touches, which come mainly by hand. Two weeks ago for the Chargers he had 15 disposals but only one was a kick. He also had 10 tackles that day, highlighting his work rate around the ground. Collier-Dawkins is a tall midfielder who can also push forward, but he trusts his handballing more than his kicking at this stage. He will appeal as a player who could develop into a clearance star. Jones is a dependable player who can be used in a myriad of roles. Hard-working runner who plays his best footy through the midfield, where he has neat skills and is a competitor. Jones didn't dominate the under-18 carnival but put out some good showings and can also be played as a smaller forward or back. Is tough, committed and determined. Kelly has improved from the start of the season to be in the mix as a top-30 pick on draft night. He played a terrific game for the Oakleigh Chargers several weeks ago in which he gathered 21 touches, eight marks and four rebound-50s in their win over Calder. Two weeks ago he was beaten by Ben King, who kicked seven goals, but Kelly still won some good one-on-ones. He's athletic, big and strong and you can see him fitting in to an AFL backline. McFadyen has proven himself to be Brisbane's leading Academy prospect this year after a consistent season. He took his game to another level in the Allies' division one carnival and was named an All Australian for his efforts after averaging 17 disposals (nine contested) during the carnival. He is a big and strong midfielder who excels at the stoppages and has also shown good form in the Lions' NEAFL side. Comes from an elite junior cricket background. McLennan's trick is his intercept marking. Despite not being of key position size, McLennan is very good at reading the play in the back half and cutting off forward forays. It's what he does better than anyone else in the pool. He averaged five marks and 13 disposals a game for SA during the championships, and recently made his debut for Central District's senior side in the SANFL. Clark was Western Australia's best-performed player at the under-18 carnival, when he averaged 19.5 touches a game and five rebound-50s. it saw him claim his state's MVP award and All Australian selection. Clark is a running backman who is trusted to set up the play and get things going out of the defensive half. A smart footballer who sees – and makes – the play unfold. An attacking half-back and midfielder who has performed consistently for the Power across the season and also put in some strong games for Vic Country at the under-18 championships. Can stride down the ground and take the ball with him. Xavier's uncle Jamie Duursma played 59 games for Sydney, Brisbane and Melbourne in the 1980s, including the Demons' 1988 Grand Final defeat. Valente doesn't do a lot wrong. His highlight reel may not be quite as thrilling as others', but he has been a consistent and prolific player across the season. The midfielder captained South Australia's triumph at the under-18 carnival, was named its most valuable player and also claimed All Australian honours after averaging 23 disposals at 84 per cent during the carnival. Clubs are still divided as to whether they see Williams as a key forward who goes into the ruck, a ruckman who can float forward or a good mix of both. Any which way, Williams hasn't dominated this season like he might have hoped to. He is a nice kick for goal and can take a good overhead grab when he goes forward.